Tooth whitening(or bleaching) is a simple, non-invasive dental treatment used to change the color of natural tooth enamel and is an ideal way to enhance the beauty of your smile. Because having whiter teeth has now become the number one aesthetic concern of most patients, there are a number of ways to whiten teeth. The most popular method is using a home tooth whitening system that will whiten teeth dramatically. Since tooth whitening only works on natural tooth enamel, it is important to evaluate replacement of any old fillings, crowns, etc. 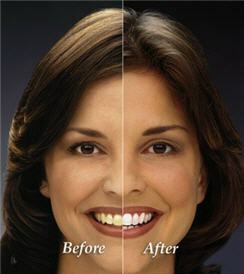 Replacement of any restorations will be done after bleaching so we will match the newly whitened teeth. At your second appointment, you will try on the trays for proper fit, and adjustments will be made if necessary. The trays are worn with special whitening solution either twice a day for 30 minutes or overnight for 7-10 days depending on the degree of staining and desired level of whitening. You may experience tooth sensitivity during the time you are whitening your teeth. Once sensitivity begins, try Sensodyne® toothpaste. If the sensitivity becomes intolerable, stop whitening for a few days, but continue with the Sensodyne® toothpaste. If the sensitivity continues call the office. If your gums around your teeth become white, stop whitening for a day or two until your gums return to their original color. Place less gel in the tray and continue whitening. Call the office if your gums remain discolored. The Zoom2!® In-Office Whitening System is a revolutionary tooth whitening procedure. It's safe, effective and very fast. In just under an hour, your teeth will be dramatically whiter. Zoom2! Whitening is ideal for anyone looking for immediate results. The convenience of Zoom2! in comparison to days of wearing trays and gradual whitening makes it the perfect choice for the busy patient. The Zoom2!® light activated gel was developed after years of research by Discus Dental, the leaders in professional take-home tooth whitening. The gel is a scientifically formulated, pH balanced Hydrogen Peroxide that, when activated by the Zoom2! light, gently penetrates the teeth to remove deep stains and discoloration. With proper care and an occasional touch-up at home, your whiter smile will sparkle for years. Other whitening systems don't compare to the Zoom2!® Chairside Whitening System. Nothing whitens better or faster.